I’m a newcomer to Chaosium’s RuneQuest pen-and-paper roleplaying game, despite being a giddy fan boy of their Call of Cthulhu line. After questioning people who have played RuneQuest I often hear tales of thick lore, high adventure, fantasy, magic, danger and, most importantly, fun! 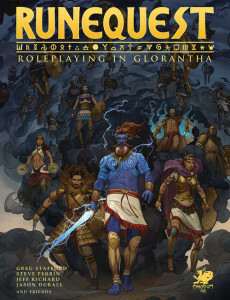 After procrastinating for many years I’ve finally got my hands on the newly released edition of the EPIC RuneQuest: Roleplaying in Glorantha PDF, spanning approximately four hundred and fifty pages. It’s time to find out what I’ve been missing. RuneQuest was Chaosium’s very first role playing pen-and-paper roleplaying game, published back in the swinging ’70s (in the year 1978 to be more precise). 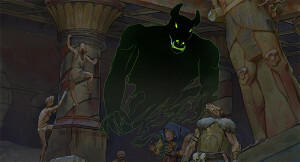 Back then the game was praised for its simple system and self-contained bronze age fantasy setting where religion and the gods have and will play a large role in shaping the world as well as its people. 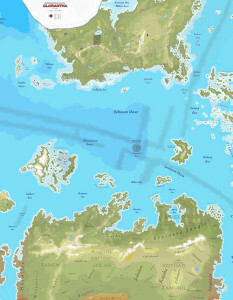 The game utilizes the Basic Role Playing system, originally created by Steve Perrin, and is set in the world of Glorantha spawned by the ‘Shaman of Gaming’ Greg Stafford, founder of Chaosium. Sandy Petersen and many other bigwig designers with their roots firmly in the world of previous Glorantha content, such as Rick Meints and the mighty Michael O’Brien, Vice President of Chaosium, have also contributed to this book. First impressions after a quick flick through the large 60+ megabyte PDF can only be described as beautiful. The layout is nice and neat, the text and text boxes are clear as well as concise, number tables are easy to decipher (more on this later) and the artwork is incredible to behold – perhaps a little cartoony in comparison to D&D art, but it gives me a grand idea of what’s to come. 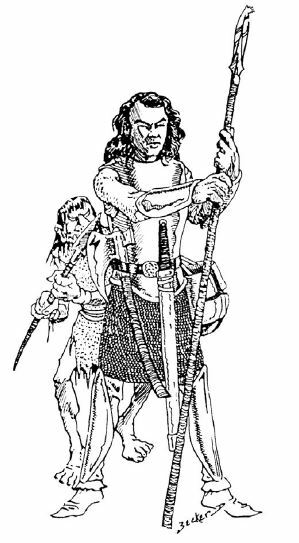 No expense has been spared, minus some of the reused artwork from other RuneQuest editions and resource books, which will be a pleasing sight for old-school fans. Now, the important part … Let’s see how it reads. Being a roleplaying veteran, I breezed through the clear and straightforward introductory sections explaining dice abbreviations and the basic nuances of playing a roleplaying game. This section is a perfect introduction for anyone new to roleplaying games. The game predominantly uses percentile based rolls to determine if a character successfully uses a skill or lands a blow on an opponent in combat. For example, if your Climb skill is 80%, the player must take the percentile die (a D100 and a D10) and roll beneath “80” to succeed at the task. Flat-earthers will be pleased to hear that most of their character’s actions take place in a world that’s best described as a flat rectangular mass filled with water, atop of which are a couple of large continents and multiple islands known as Middle World. There’s also an underworld beneath the rectangular mass, plus air gods who inhabit the space between the land and sky. [If you want to know more about how Glorantha works, check out this detailed description on the official Glorantha website.] 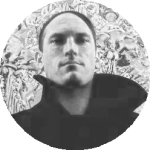 The inspiration from real world mythologies that Greg Stafford used to create this dense and interesting universe come from several different places including ancient Greece, Mesopotamia and Chinese mythologies. More information on this in a separate review soon on Games vs Play! 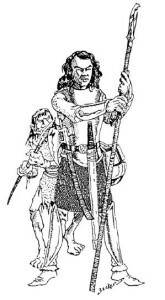 In the world of Glorantha players are not “wandering murder hobos” akin to what you’d find in Dungeons & Dragons. Players take on the role of Adventurers who have a great sense of pride in their religion, their clan, their community and their family, which provides a very strong anchor to the world. This also prevents players from making uncharacteristic or meta-game decisions that directly go against how they’ve created their character. 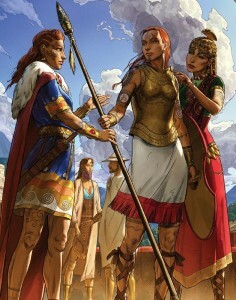 Overall this enhances the player’s roleplaying experience and draws them deeper into the fictional world of Glorantha. Despite the Adventurers’ love for their homes they will spend most of their time exploring this beautiful world. And if your character perishes it isn’t just the end of your Adventurer’s life – a PC’s death also affects your character’s clan, cult or, possibly, the god you worship. Creating an Adventurer looks to be incredibly fun! The lack of character classes and no leveling system are refreshing. Just because a player may call their character a thief doesn’t mean the character is not allowed to eventually cast earth shattering magic or wield a broad sword like a behemoth barbarian. All skills, no matter how bad they are in the beginning, can eventually be improved. In fact, everyone in Glorantha can cast spells to varying degrees. While creating a character, players should be mindful of their choices as there are some cascading affects which will directly impact the Adventurer’s passions, skills and rune use, as outlined later. During character generation, players must first select their Adventurer’s homeland. Each homeland’s different location in Glorantha means your character will have a cultural stereotype, a steed they will most likely use, common cults and suggested occupations. A bit of forethought is required by players to ensure their Adventurer gets the most out of their character as homelands specialize in particular runes and passions, raising their base percentage when attempting to roll for their runes success. Example, an Adventurer born to a Praxian tribe of High Llama riders will automatically gain 10% to their water elemental rune, so a player wishing to specialize in this rune and its associated skills or magic should probably chose this tribe. More on passions and runes later. Player’s are not simply rolling for character attributes, but also their past history and family ties. A lot of time can be spent considering the origins of your character including the Adventurer’s homeland, grandparents, parents, siblings and how your character has survived Gloranthan events up to the point the player takes control of the Adventurer. These randomised rolls can directly affect your character’s passions, such as hate towards another clan, loyalty to their current cult or love for their family, although there’s nothing really stopping players from selecting these options in accordance to their preferences (the Gamemaster being the only exception). So what’s the deal with these passions? Passions provide a good roleplaying basis for your character and can augment combat rolls, skills or other abilities after rolling for under your passion successfully. Passions include a character’s loyalty to their clan, love for their family, devotion to a god, fear of a certain creature or individual as well as a deep seeded hate for chaos-worshipping monsters. Example: if your Adventurer has an intense hatred for any chaos rune-loving non-human creature, the player can roll for their hatred against the forces of chaos to temporarily improve future combat rolls. On the other hand a failed passion roll may temporarily decrease your Adventurer’s skills or abilities. Skills are needed for your character to succeed at certain tasks, such as jumping, riding, climbing or speaking another language. You can reroll any of these abilities if failed (and it’s not a fumble) at a temporary 25% loss to that particular skill. This cannot be used for combat rolls. Characters also have seven characteristics, such as strength, charisma, power etc, across which points or random rolls are allocated, most using 3D6. When an Adventurer wants to perform an action that isn’t connected to a skill, percentage dice are rolled against the most useful characteristic’s base number multiplied by five. For example, if an Adventurer with a strength of 15 wants to lift a heavy rock they would have a 75% (15 x 5%) of being successful. A small formula or number chart can be used when the Gamesmaster determines the necessary roll needed for a character to be successful in their actions. That’s most but not EVERYTHING a player should cover when making their characters. For those who have little time to roll characters, there’s some nice fleshed out pre-generated characters in the rule book which can be used straight away and plopped straight into a game. Melee combat starts with determining a character’s strike rank by comparing the character’s SIZ and DEX to find the relevant strike rank number. Volleys of arrows or magic can be avoided with a DEX or spells. There’s attacking, parrying, aimed blows, use of shields, use of various weapon types, modifiers for moving targets, crushing damage, piercing damage, mounted combat, troop formations, even hit locations made against specific parts of a character’s body. If armour is worn, the struck location is determined by the roll of a D20, subtracting points from both the target’s body part and their overall hit points. There’s a lot to consider during messy large scale battles, not including rune, passion and magic use. Fortunately for beginners, some combat where two opposing clans meet can be resolved by presenting a champion to the opposition. The clan can accept the challenge then present one of their warriors for one on one combat. It is probably recommended players and Gamemasters take their time with some basic combat to get the hang of things before delving into a full scale war. Even so, be warned as characters can break arms, lose limbs or even die horribly if they pick the wrong fight. 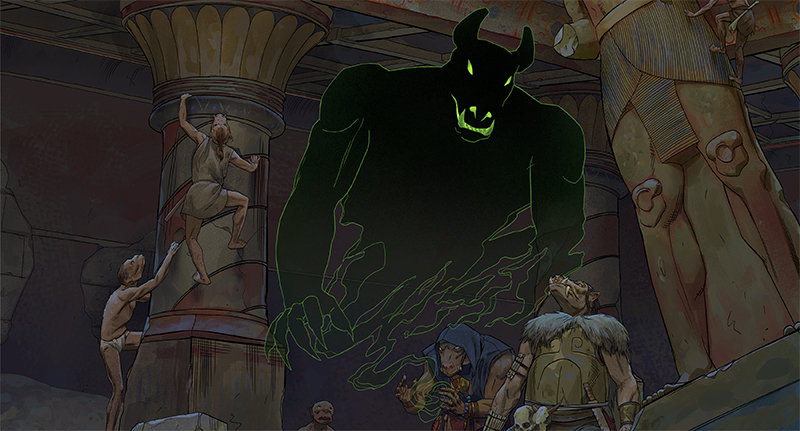 Three types of magic exist in Glorantha: spirit magic, rune magic and sorcery. Spirit magic is the character’s ability at casting ‘battle magic’ featuring a large number of spells. Here’s a handful for you: confusing opponents, controlling opponents, counter magic (throw their magic back at them! ), healing spells as well as detecting various traps, the presence of life forces and the presence of the undead. That runes play a big part in a game called RuneQuest comes as no surprise. Runes operate similar to passions. The use of specific runes can increase or decrease the player’s other skill rolls. For example, specializing in the Darkness rune may give an Adventurer a better chance to use their stealth skill with an appropriate rune roll. Runes have been broken down into four types: elements, forms, conditions and powers. Each rune holds special abilities and, depending on the god your character worships, will add percentile points to specific runes. Rune magic on the other hand is a little different. After players join a cult, they may sacrifice one power point permanently to establish a link with their worshipped god. The player now has one Rune Point. The player can spend rune points and magic points to cast spells by channeling directly to a god. As you can imagine, some of these spells are epic. Characters can fly, become invisible or even summon spirits to do some fighting on your behalf! For people that wish to cast spells without worshipping a specific god, sorcery may be for you! This includes spells that can be used by understanding a rune rather than being directly affiliated with any particular rune. A sorcerer can also create their own spells. Rune cults can assist you to learn new magical abilities and powers, predominantly through special adventures called “heroquests.” A Heroquest is a spiritual journey that can greatly enhance your adventurer powers and standing in the world. Your character starts off as a lay member and then can progress up their cult’s hierarchy all the way to a Rune-Lord Priest. Cults worship an individual major, medium-powered or minor deity. There’s a lot in the book about different gods, information on temples and an outline of roles and responsibilities within a rune cult. Players decide on the amount of POWER they wish to spend prior to casting most spells. Using more POWER will increase the chances of successfully casting the spell, or you can just stick to the minimum required amount needed. Modifiers exist which can improve a character’s ability at casting a spell, such as rounds used to cast the spell, ritual preparation prior to combat, meditation or ritual practices. There’s some chapters that have a brief look at Shamans and spirit walking which looked fascinating. Other short chapters (well, at least in comparison to other chapters in this book) outline living conditions in the world of Glorantha and events which may occur in between adventures such as your adventurer gaining or losing family members or gaining or losing wealth. 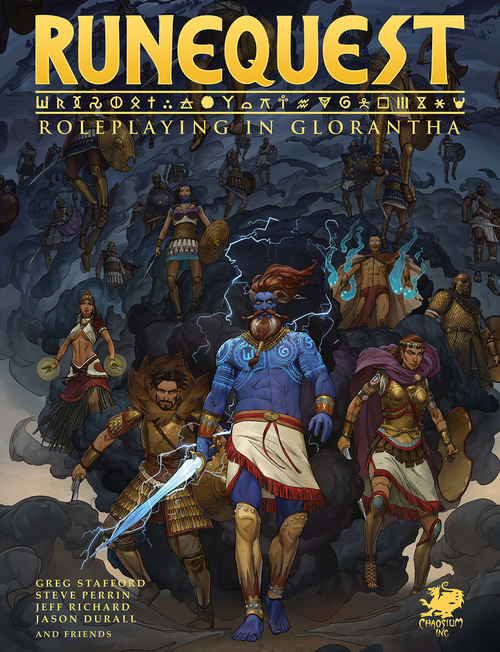 This new edition is definitely aimed at those wishing to play in Glorantha as opposed to host a game, but it definitely gives those who want to run a game a thorough of idea what to expect. This may be a bit daunting for some Gamemasters due to the heavy lore, and would be definitely daunting for players new to roleplaying games. 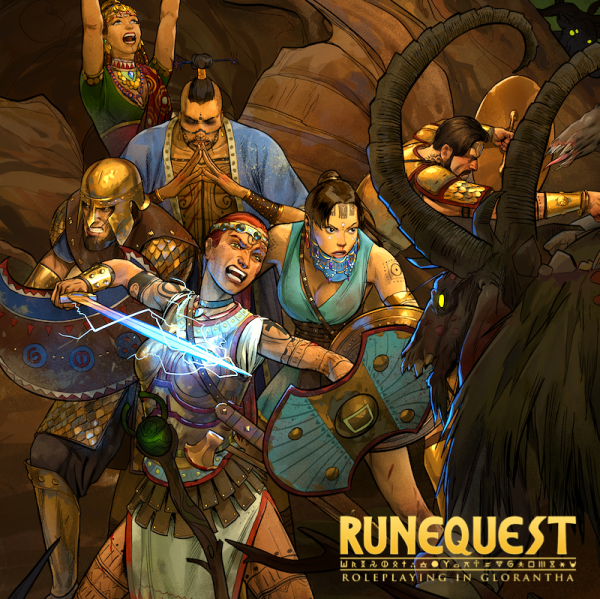 For those that are a little unsure of making the purchase the Quickstart PDF of RuneQuest is available for free with a brief summary of the rules along with a free adventure. 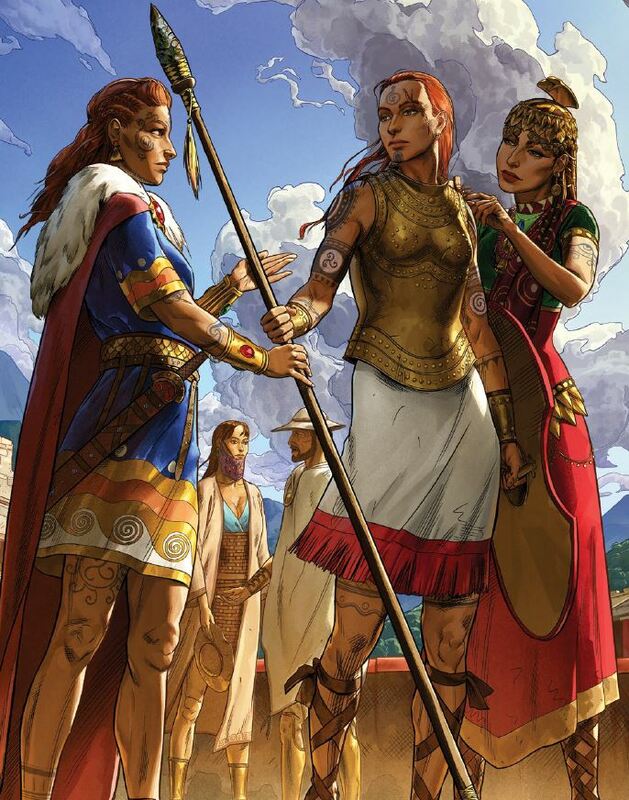 What you pay for is what you get, which is an outstanding insight to gaming in Glorantha. I will definitely be giving this a more thorough read through and, when the time is right, I think I’ll attempt to run a game. The world of Glorantha may be too rich for some. For those who don’t like tables and formulas … there’s some tables and formulas. A great read, incredible world, great rules, splendid artwork and makes me thirsty for high adventure in Glorantha! You can get your own copy of RuneQuest: Roleplaying in Glorantha and other Glorantha supplements from the Chaosium website. To find out more about the latest reviews, stories and other cool things in the world of games, like us on Facebook. And remember – if you’re game, we’ll play! All images courtesy of Chaosium.